Businessman Gordon Macrae – husband of missing Inverness mum Renee Macrae – has been declared bankrupt after a fellow Ross County FC director took him to court over an alleged £400,000 debt. A petition for sequestration under the Bankruptcy (Scotland) Act 2016 was raised against Mr Macrae by Leo Daly at Inverness Sheriff Court. The petition was granted by Sheriff Gordon Fleetwood, who appointed Kilwinning-based Accountant in Bankruptcy (AIB) to be trustee of Mr Macrae’s estate on behalf of his creditors. Mr Macrae, 81, who lives in Inverness, did not appear in court and was not represented by a lawyer, so did not defend the action. Former land surveyor Mr Daly, who owns farmland in Tain and lives in Inverness, said he raised the action after chasing Mr Macrae for cash he claims he had loaned the businessman towards a planned building project in the city. The 69-year-old added: “It was a three-year loan, but that was six-and-a-half years ago. There is £411,000 outstanding. 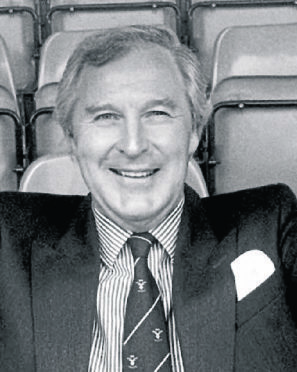 “We were acquaintances at the time, and were both directors of Ross County Football Club. “He kept fobbing me off when I asked for my money back. He was never going to pay me back and I felt stabbed in the back. “So going to court was my best option in a bid to try and get some of the money. It is a lot of money. An approach was made to Mr Macrae for comment about the court case, but he declined. Earlier this month police carried out a search on a flooded quarry near Culloden Battlefield in the latest development in the case of his missing wife, Renee MacRae and her three-year-old son Andrew. Mrs MacRae left her home in the Cradlehall area of Inverness with both her sons on Friday, November 12, 1976, before dropping her elder son Gordon with her estranged husband Gordon MacRae. She turned south on to the A9, reportedly on her way to meet her lover, Bill MacDowell, an accountant in her husband’s building company, with the couple said to be planning to start a new life on Shetland. Her burned-out BMW car was found with a bloodstain in the boot in a layby off the A9, a mile south of Tomatin. A murder inquiry was launched, but the bodies of the mother and her three-year-old son have never been found and no one has ever been convicted of their killing.